Preserving the nature and environment with its entire employees, the Cornelia De Luxe Hotel possesses the decisiveness and manpower required to introduce the best-quality service to its distinguished guests. The primary objective of the hotel is to meet the requirements and expectations of its customers, to maintain self-improvement and renovation, of course, keeping the food safety system practices and hygienic context amongst the must-abide traditional applications. When acting in understanding of Total Quality, to maintain, to improve the dynamic structure of the quality management system and to make its effectiveness steady is the indispensable management policy. The hotel which competes carrying out its activity on the national and international markets in the light of these principles shall always manifest necessary decisiveness to be able to become ever leader. 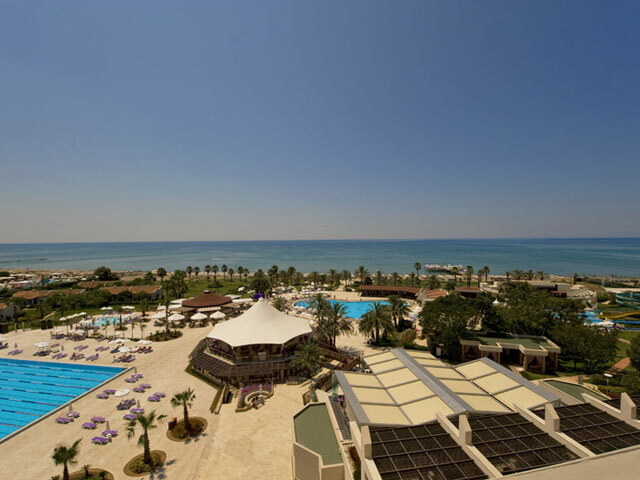 Belek; being situated together with its natural beauties at a 35–km distance from Antalya on the shore of Mediterranean Sea, where many beach hotels and golf hotels have been rendering their services over its long coastal line. 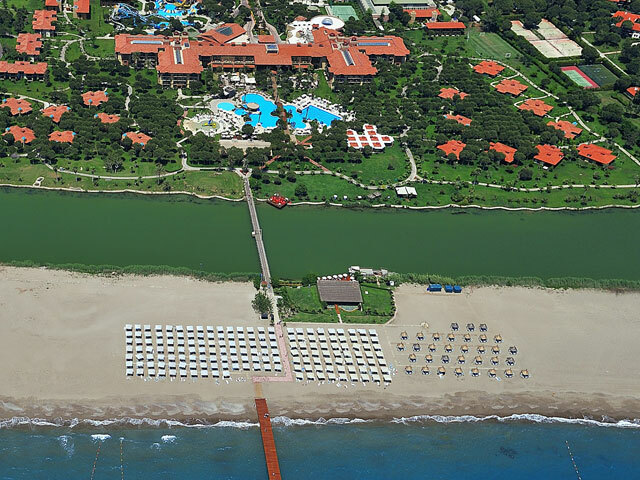 Advancing in its path with stability to offer the best quality service within these natural beauties, the Cornelia De Luxe Resort stands on zero-sea level position over the coastal stripe of Belek within the locality of Ileribas - Belek. 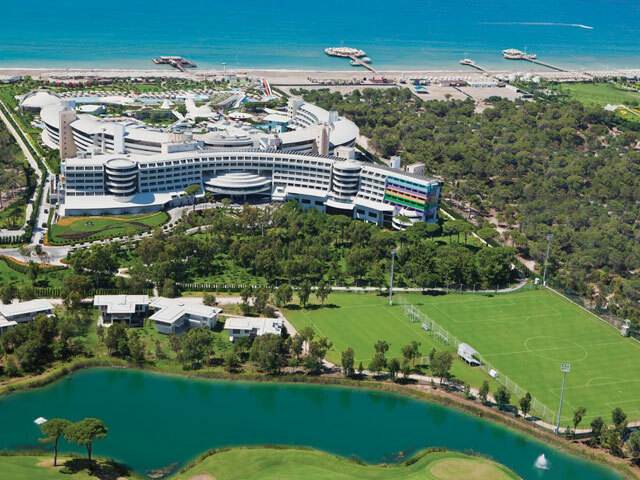 It is at 35 km away from Antalya Airport and at a distance of 45 km from the city center of Antalya.As for the “Nick Faldo Championship Golf Course” Cornelia Golf Club has been showing hospitality for its golf guests since November 2006. Cornelia is a perfect host that helps you to realize your journeys in such a manner you would enjoy more than your daydream. Daily cleaning and every 2 day linen replacement are being executed. Also Available 3 handicap guest rooms and non-smoking rooms. To enable you spend your vacation in a comfortable way as well as having the maximum satisfaction herein, these rooms having been designed in such a manner not to make you long for your domiciliary luxury, where variety of green colors dominate, yielding a refreshing impression let you experience the holiday in your imaginations. The floor is coated by carpet. At the main building, most of the rooms has sea view. To enable you to spend a peaceful and safe holiday together with your children, these twin rooms consisting of two separate bedrooms have been design in consideration of family preferences. These rooms bearing the same features as with those at standard rooms of the main building which stand within triplex Cornelia Garden Hotel section, would be the initial preference for those ones who desire their vacation within the greens. The rooms have garden view. These villa houses, which are situated amongst the trees and surrounded by the water ways and connected to the pool by means of private quays, are waiting for you to materialize your imaginations. All of the rooms which are specific spaces within themselves at the villa houses section stand within a garden having an access to the pool and can be directly gone into the pool from the terrace. From a specially decorated Restaurant and Bar situated here, a 3-time specific meal service is furnished (Dinner is subject to prior reservation). The floor is coated by ceramic. 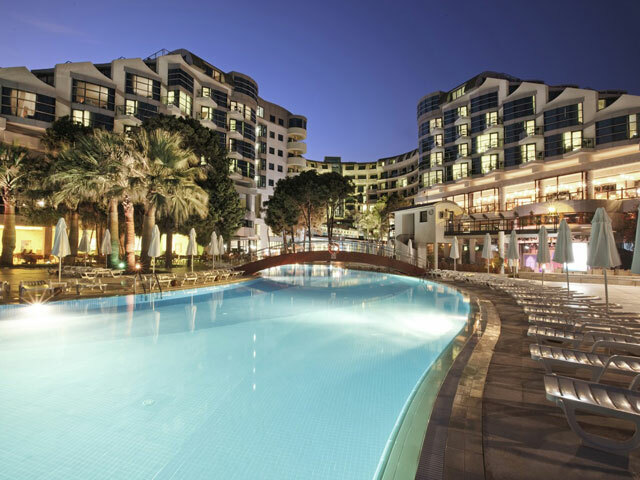 With their 100 m2-large areas which enjoy the gorgeous Mediterranean Sea view, these suits offer an opportunity of experiencing the privilege of De Luxe during your holiday with its luxury, elegant design and Jacuzzi with sea view. These rooms, with a minor terrace garden, have a direct sea view. Throughout your holiday, you would not only take a rest, but have the facilities where you could perform various sporting activities as well. All day long, Cornelia offers you an opportunity of experiencing a joyful vacation doing sports via participation in many different on land - and in - sea activities by accompaniment of the joyful and experienced animators, together with crazy games arranged by the pool or in the pool. * You will find 3 tennis courts with an illumination system. Reservation required and Tennis Trainer is available. Night illumination is with charge. Non-powered water sports: Wind surf, Catamaran (certificate obligatory), Canoe and Sea bike and all are free of charge. Reservation is required for all. Powered water sports: Jet ski, Parasailing, Water Ski, Banana, Ringo etc. are on charge basis. The water sports are performable between 10.oo A.M up to 18 P.M. during summer season. “Crazy Games” are performed by the pool and in the pool. Games Center: Paid 2 – laned bowling is at your disposal between 09.00 – 24.00 hours everyday. Furthermore free Play Station, Air Hokey, Jeton-operated electronic vehicles, and table games such as Backgammon, Chess, Okay, Playing cards etc. are in your attendance between 10.00 – 24.00 hours everyday. Everyday, entertaining sportive activities, pool games, competitions and the activities wherein the children would improve their creativities accompanied by competent animators are being offered. In addition, air conditioned- TV room, DVD, Video motion picture shows are available. Every night, a Child Disco takes place and Child Show is given, staged by the children 2 times a month during summer season. The youngsters below 4 years old may visit the “Cornie Child Club” under accompaniament of their parents only. * Some of the activities can only be performed during summer season. Payable horse – riding and banana tour during summer season. For little children: free ball pool, jeton – operated electronic vehicles, air hokey and Play Station. Baby Care: * In the event of being notified 1 day earlier, there is baby care service for children 1 year old and above. * Hourly fee is: € 10 child/h and maximum duration is 4 hours. The variety of music played by the competent DJs addressing to the guests from all groups of age and culture and the colorful nights when you would be able to perceive the taste of the amusement engulfed by their excellent sound, light and particular effects are expecting your call on at the Disco. The special nights are organised on certain days during Summer Season, namely “Foam Party, Pyjamas Party, Hippy Night, Black-and-White Nostalgia Night“ and occupy a very joyful spot within your unforgettable holiday memories taken place at Cornelia. You are ever welcomed by various programs to the Amphie Theatre with a 450 pax capacity, equipped with the newest sound, light and effect hardware of the Cornelia. The entertainment team of Cornelia takes you to a different world every night. The Pool Side - Gala Programs and Garden Parties organized on certain days of the summer season occupy the first row in your memories. The amusement programs during winter season keep going with dances at Harmonia Bar, competitions, quizzes and live music nights. During 12 months of the year, the most experienced and the best live music groups of the region are with you at Cornelia. A wide range of repertoire performed in many languages by such groups calls you in dancing. In the current business life, most of us do not show adequate interest against our body getting tired and exhausted due to business tempo. Therefore, the holidays are the hard-to-find occasions. The fully-equipped Fitness Center at Cornelia is offering this splendid opportunity to you. Not being satisfied even with this, you, in attendance with the experienced animators, participating in the traditional morning gymnastics, stretching, in-water gymnastics and also Step & Aerobic activities during summer season, remain energic. The Hotel has been offering 24 hours food and beverage service to his guests with the concept of “De Luxe All Inclusive” system. The hotel establishing a distinct perspective towards the guest service with its well-trained and experienced staff, has been presenting an integrated unconditional guest satisfaction-focused service perception, quality, friendship and comfort. * At the main restaurant Cornelius; open buffet service is being offered during breakfast, late breakfast, lunch and dinner (child and diet buffets are available). 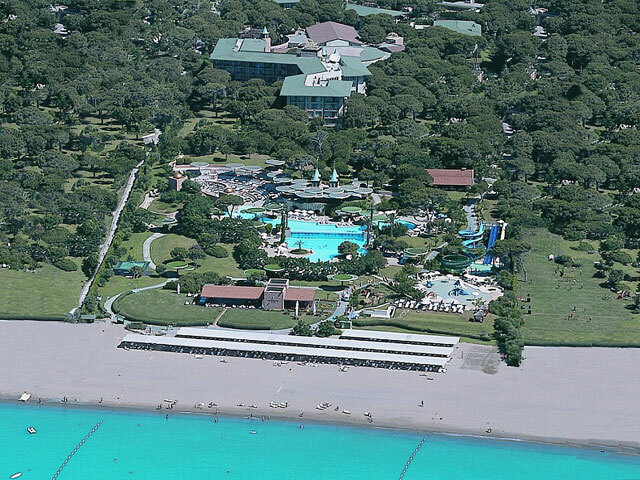 * To meet the special tastes of the guests,the hotel offers 4 A la Carte restaurants. Tai-Pen Restaurant (Far Eastern Cuisine) – for 50 persons. * The A la Carte restaurants are free of charge and requires prior reservation. * During the season, on certain days, “Barbecue Party, Gala Night, Garden Party ” kind food and beverage activities are organized and offered to the guests without charge. * There are 6 bars where you may have the pleasure of drinks. * At the hotel you will find one bar open 24 hours. (during summer season Daphne Bar, winter season Harmonia Bar). * At the rooms, there is a Minibar service (beer and soft beverages). The minibar is completed once a day between 10.00–16.00 hours. * There is a room service (within menu) serving for 24 hours. Should you imagine having your breakfast by the pool ,accompanied by pine trees and the singing birds or should you wish to enrich Mediterranean nights with the Mediterranean meals, then the Hedera Restaurant is at your disposal. The richest variety of the world is found within Turkish cuisine. Also the most popular meals of Turkish cuisine are available at our Nazar Restaurant. The Nazar Restaurant with its service reminding of homelike atmosphere would even cause you to say “it is worth for being here”. Would you like to taste the most specific tastes and live the magic, mystery of far east within romantic environment of Mediterranean ? Assuming that you would do so, there is always the Tai-Pen Restaurant for you. While the dancing and entertainment is soaring up to the peak due to the most popular music below the cascade, you would also enjoy the Cornelia’s nights. You are either on the hot sands or the magnificent quay above sea. The Solaris Beach Bar is right there, just by your side. Daphne Bar & Restaurant offering 24 hours food and beverage service and functions as the center of the entertainment and activities as well. The life is very fast here, come on, join them.